If there's one thing Palestinian filmmaker Mayar Hamdan hates to be called it's definitely "female Wes Anderson of the Arab World". Mayar, who has been outspoken on Instagram about her hatedred for this comparison, has a point. She's nothing like the infamous film director. To be more specific, Mayar is nothing like any film director I know. Her visuals are awe-inspiring, the kind I personally believe the region needs more of. She touches on the narratives of the region in a uniquely personal (and relatable) way, focusing on the social issues that rarely make it to our mainstream screens. 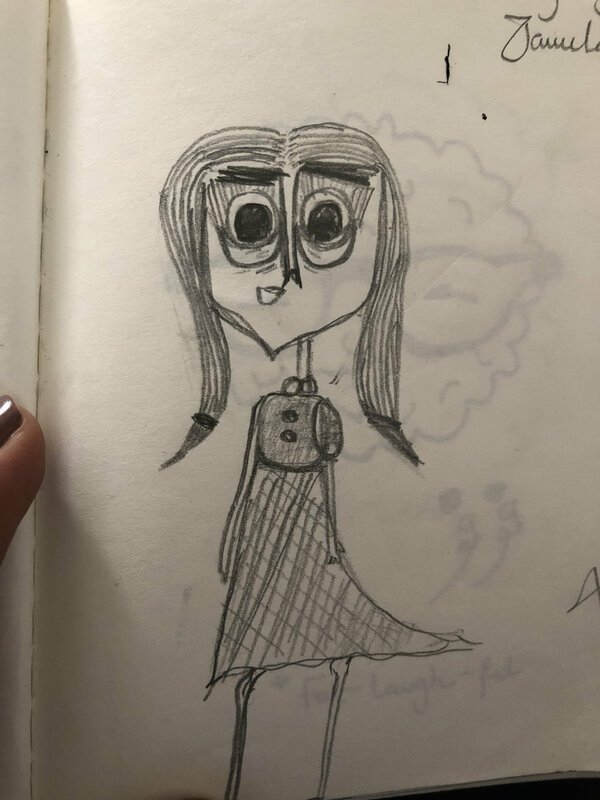 The first time I saw Mayar's work, I was immediately intrigued - I felt like I discovered a new voice for animation and filmmaking in our region. Below, we share our interview with Mayar for our sixth issue of follow the halo. Hi Mayar! Tell us a little bit about yourself! I’m Mayar Hamdan. First and foremost, I’m a storyteller. For me, stories take shape and form through many platforms and a variety of content. I am a firm believer that great stories need to be shared, preferably through moving pictures. So I also consider myself a filmmaker, both artistically and professionally. However, I don’t think I could be classified as a traditional filmmaker. I’m originally Palestinian, born in Cairo, lived in Jordan briefly and grew up in Doha. As every Arab millennial out there will tell you: I am not exactly sure where home is. I graduated from Northwestern University with a degree in Media Industries and Technology, and a concentration in Film, Storytelling and Animation. During my time at school, I made my first highly stylized film ‘Asfoora’ (2014) (https://www.behance.net/gallery/32657023/Asfoora-(Short-Film)). I then went on to producing and art directing other films. Post-graduation, I moved to Barcelona where I worked at multiple companies and start-ups as a web content creator, video game story developer, and an animator. Currently, I work on the Doha Film Institute’s Film Training and Development Team. Independently, I write, direct, produce, script develop and art direct films. I am obsessed with colors and color theory (especially in film). My obsession plays a role in almost everything I do, from my outfits to my Instagram posts to my own films. Often times my films come to life depending on the particular colors I am obsessing over during the time or vice versa. From what I know, you're currently working on a short film "Beit Byoot". Can you tell us a little bit about that and how the idea came about? I remember the exact moment the idea for ‘Beit Byoot’ came about. I was at a women’s only party that my mother had forcefully dragged me to. I don’t particularly enjoy these parties and its pretty evident. I usually just sit in the corner in my really uncomfortable heels and pints of makeup on my face counting down the minutes until I can go home and be my real ‘make-up free, PJ and socks-wearing’ self. My mother caught me rolling my eyes when all the girls “my age” got up to sit together and chit-chat. She cued me by giving me one of her infamous death stares. I got up to sit with the girls and attempt to engage in the mindless and somewhat shallow conversations. They discussed each other’s dresses, where they got them from and who’s best and worst dressed. And they, of course, watched each other’s Snapchat stories and continued to be the judge and jury of each-other’s dress styles. I had had just about enough so I decided to go outside for some fresh air. I found a group of little girls, who to my surprise looked just like miniature versions of their mothers. They even sounded just the same. I watched as they played a well-known game called ‘Beit Byoot’ that is played by little girls from the Levant region. The game consists of bringing your dolls to the playground, gathering with their girlfriends, dressing up the dolls and inventing stories along the way. The rules of this game, however, can be pretty brutal. I recalled playing the game when I was their age too. At the time I had dolls that were burnt by my older brothers and stitched back together and painted by me when my mother refused to by me new ones. I remembered how difficult it was for me to play with other little girls because my dolls were so “ugly”. A couple of months after writing the script in the DFI/Torino Film Lab’s Short Script Writing Workshop, I visited Luis Barragan’s (my favorite architect) Studio in Mexico City. His style was so surreal. It felt like walking into an adult-doll house, where everything was fitted to his own shape and size. So I started to think about how the physical space these women gather in plays a huge role in the giant game of “pretend”. That's amazing! It's also so relatable - I feel like I can totally empathise with that experience, especially since this experience of playing "beit byoot" is a distinctly Arab female one. That being said, to what extent do you feel that your Palestinian heritage/roots influence your work? I have personally not written any stories or made any films directly about Palestine. But a lot of my films/art works, photographs, etc., explore our odd Palestinian traditions, culture and the idea of “home”. Without a doubt, the mere fact that my films are in Arabic (Palestinian/Lebanese dialect mostly) insinuates where my roots come from. I definitely attempt to tackle issues in the Arab community that make me angry, especially when it comes to the hypocritical and sometimes ridiculous standards that women set for other women and girls. What are your thoughts on film scene in the region? The films in the Arab region are growing at an incredible rate. More and more we’re hearing about Arab stories internationally. This year alone 5/6 Arab films at Cannes Film Festival! Working at a film institute, I’m exposed to films and scripts from within the region on an almost daily basis. The one thing I’ve come to notice is a pattern of stories that sound, unfortunately, similar. Most Arab narrative films/documentaries attempt to tackle issues such as war and the refugee crisis. It’s alarming that these stories are similar, even when they are set in completely different places. It means that there’s a greater discussion to be had outside of the political-realm. But as we continue to be shaped as a region, so will our stories. The dialogues we’re now beginning to have as a result of being exposed to these Arab films will also shape filmmakers artistically. It’s really very exciting to see what will come up next and how we’ll evolve. What do you think are the strengths and challenges of these stories? A strength we have in contemporary Arab cinema (which wasn’t as evident before) is that we’re beginning to talk about taboo subjects and challenges and express ourselves in a beautiful variety of ways. However, I believe that if the only stories that come out of our region are going to be about war and war-induced circumstances, we won’t move forward on a social level. While I understand the instability of our region and the effects that that has on our identities and in turn our stories, I personally choose not to focus on the politics and the war-after maths. I’d rather focus on social and communal issues that I believe are equally as important. I believe that by tackling the micro-issues in our societies, we can then begin to tackle the macro-issues. Since in this issue we celebrate Palestine, in what ways do you believe we can better the narratives and stories we tell about/around Palestine? Do you have any advice for young aspiring filmmakers or storytellers from Palestine and the region in general? Again, I don’t personally write my stories/narratives particularly about Palestine, but rather about some of the traditions or culture that come with being a third-culture Palestinian. But I do believe that better access to Arabic-content/resources about filmmaking/storytelling would strengthen what we’d like to express. Another way we can better the stories is to remember that stories about real people with relatable troubles have a greater ability to emotionally reach an audience. From my own experience with reading/consulting on scripts, stories that focus on characters rather than plot or circumstance/setting tend to be more powerful. My advice to any filmmaker or storyteller would be to explore, observe and converse. Go out and explore with your camera and shoot whatever catches your eye. Observe everything and everyone around you. Film is a medium that can be accessed everywhere and anywhere thanks to the internet so be sure that this craft will require you to converse with people about themes and real-world struggles. Do you have any Palestinian artists or sources of inspiration you can share with us? At the top of my head, Palestinian filmmakers who are sources of inspiration for me include Areen Omari, Annemarrie Jacir, Cherin Dabis, Hani Abou Assad… well his older stuff… Palestinian writers that I’m extremely influenced by include Mahmoud Darwish and Ghassan Kannafani. (My dad used to force me to read Palestinian literature when I was a kid.) I’m also obsessed with Samia Halaby’s use of color in her artworks. Due to the nature of my work, I also have access to an array of contemporary Arab films and female filmmakers as well such as Nadine Labaki and Kouther Ben Hania. I also have to constantly watch a lot of films. For contemporary film or video art purposes, I’m very heavily influenced by the content on Nowness and Design Milk Everyday and Shortoftheweek’s experimental film channel. Also, through mobile gaming/, animation and story development I realized there was still a whole world out there that I have yet to explore: The world of interactive storytelling. I know what you’re thinking, that’s just a fancy phrase for video games, right? My future plans will hopefully involve me delving deeper into the interactive world but through film. Interactive cinematic experiences. For more about Mayar and her work, you can check out her Vimeo page or follow her on Instagram @hamsterdam. Jun 27 Submission: Omani Artist Marwa Al Kalbani Shares Her Project "Find the Perfect Wife"